We here at Philpott Pre-Owned Super Center want to make sure you're as informed as possible about the advantages and disadvantages of a tonneau cover. 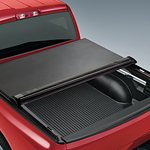 One lesser known advantage of utilizing a tonneau cover is that it makes your truck far more aerodynamic than with no cover. This is because the air goes over the top of the bed of the truck as opposed to going into the bed of the truck and making the engine work harder to move it forward. This also saves money in the form of fewer fill ups at the pump. Because your truck is now running more efficiently, you will be able to keep more of your hard earned dollars every week. A disadvantage of the cover is that it limits the size of items that can fit in the back of your truck. Looking for a pre-owned truck or SUV that gets the job done for a very reasonable price? Then come see our friends at Philpott Pre-Owned Super Center today!